Vrusk look like large insects. Eight legs grow from their abdomen, four on each side. Their torso is upright in front of the abdomen. The torso is humanoid, with two arms connected at the shoulders. The head is above the shoulders. Vrusk hands are circular pads with five fingers spaced evenly around the edge. A Vrusk's shoulders are double- jointed, so they can rotate their arms in a full circle without straining any muscles. They can reach any point on their abdomen or behind their backs easily. A Vrusk's body is covered by a carapace (hard shell). This shell is jointed at the Vrusk's elbows, hips, knees, etc. The carapace protects the Vrusk from bruises, cuts, scratches and other minor injuries. Unlike insects, Vrusk have an internal skeleton to support their bodies. Young Vrusk have a blue carapace with bright orange near the joints. As the Vrusk gets older, its carapace changes to dull green with yellow joints. Vrusk have large eyes that are protected by a hard, clear covering. The mouth is surrounded by four eating mandibles. The two larger mandibles hold food while the small ones tear it apart and place it in the mouth. They are omnivores. Vrusk have lungs, and breathe through many small nostrils under their abdomens. This arrangement makes it difficult for Vrusk to swim. Vrusk have very good color vision, but they see more of the short wavelengths (blue and ultraviolet light) than Humans do, and less of the long wavelengths (orange and red). Their sense of smell is centered in their antennae, and is slightly better than a Human's. They also can touch with their antennae. Their hearing is about the same as a Human's. 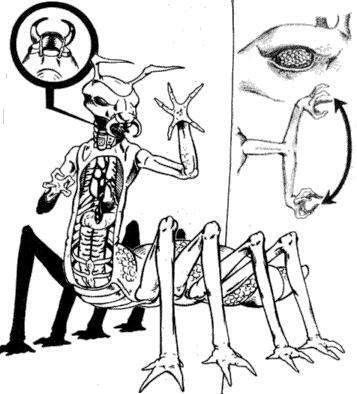 Vrusk speak by combining clicks produced by their mandibles and buzzes produced by a plate in their mouths. Vrusk are hard-working and practical. Their society is organized around independent corporations. To a Vrusk, the company he works for is his family and his nation. The company determines everything about the Vrusk's life; who he lives with, what his job is, where he travels, etc. Vrusk give their company name before their personal name. Vrusk have two types of corporations: conglomerates and trade houses. Conglomerates have business interests in many areas. A single conglomerate might have divisions that build computers, operate farms, train lawyers and set up colonies. A Vrusk that works for a conglomerate usually works for only one division, and might not even know what other divisions the company owns. Trade houses, which are more common in the Frontier, specialize in one type of business. Because all Vrusk working for a trade house do the same work, trade houses usually work together. For example, a trade house that builds farming equipment would hire accountants from an accounting house to keep their financial records. Business between companies is regulated by laws that are so complex no one besides Vrusk have ever fully understood them. Vrusk also love beauty, harmony and order. The goal of most Vrusk is to become wealthy, collect art and live in peace. Their love for beauty makes them unwilling to get into fights that do not involve their company. However, Vrusk that are defending their company will do anything to remove the threat permanently. Vrusk adventurers, however, do not belong to a company. Some are independent businessmen, some are company employees who were fired and some are just too rebellious to put up with company rules. A few start their own companies and eventually become leaders in their communities. Vrusk get along well with the other races. They understand Humans the least because, to a Vrusk, Humans seem unpredictable and a little lazy. All Vrusk are ambidextrous (they can use both hands equally well). Players with Vrusk characters do not need to choose whether their character is right or left handed. Vrusk can shoot weapons, throw grenades, write, catch or grip with either hand. Because Vrusk have such a complicated society, they are able to understand all sorts of social dealings. All Vrusk characters start with a Comprehension score of 1D. This score is the character's chance to figure out any type of social dealing that the player himself can not, and is added to Perception when using. For example, a Vrusk is following a Human he thinks is a spy for another company. He follows the Human into a bar and sees him talking to a group of rough-looking Wookie, occasionally glancing over his shoulder. Then the Human hands some money to the thugs and leaves the bar. The Vrusk player is not sure what the Human was trying to do, so he tells the GM he wants to use his Comprehension ability. If he rolls successfully based on a difficulty determined by the GM, the GM will tell him that the Human paid the Wookie to attack the Vrusk if he tried to follow the Human from the bar. A character's Comprehension score can be increased by spending character points.